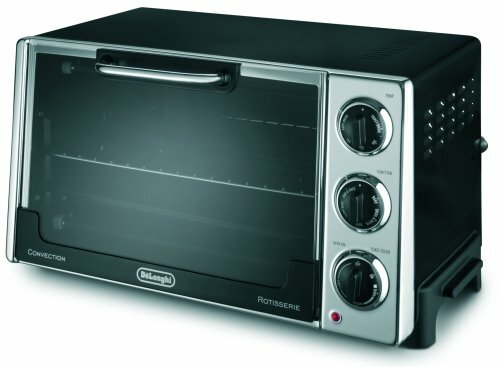 About DeLonghi EO-2058 6 Slice Convection Toaster Oven with Rotisserie, there is really nothing valuable to talk. But if you decide to buy this product, you’d better read this review carefully before paying your money. An owner owned this oven for years says it is just an average toaster oven. Sounds OK? However, I think it’s the best compliment for this oven because in my research I found that it had many shortcomings that annoyed buyers. Furthermore, this toaster oven, like many other convection toaster ovens, is not “true” convection oven so research carefully if that is important to you. DeLonghi EO-2058 has baking, baking with convection, broiling, toasting, slow baking, and keeping warm for you to choose from. Interior – DeLonghi EO-2058 also comes with a non-sticky interior and an interior light which makes it easy for cleanup and to look at ongoing progress. Toaster – It has a toaster function that lets you toast up to 6 slices of bread. Those big families that have over 3 persons need a 6 slice size. Accessories – It also comes with a broiling tray and an interior rack all of which are complete non-stick water proof and easy to cleanup. What Do Buyers Say About The DeLonghi EO-2058? Clean up – Customers are happy about the non-stick interior which eases up a great deal of cleaning up. Interior light and the tray that could be taken out makes the cleanup part more comfortable. Sound – Like many other convection ovens, its convection feature is very loud and disturbing. Short Service Life – If you prepare to purchase it because you like the rotisserie and convection function, you may get disappointed because most complaints from owners are against to this two elements for the fact that they won’t work after months of use. Heating – A fair number of owners complained that it is very slow to heat up. So if you have a big family you’d better choose a faster model in case your family members waiting too long. Illegible Lettering – Lettering on the knob will be illegible after a certain period of use. Customer service – A few users has experienced bad customer services because they respond quite slowly and prevaricate. Chemical Burning Smell – Some buyers found that the fan and rotisserie mechanism will produce chemical burning smell so if you choose this product you’d better leave it when it’s working. However, if you buy the model without rotisserie, you might not face this problem. There are many toaster ovens available to choose from at this price. I think this model doesn’t worth the money and I strongly recommend you buy other models.